Nintendo has released some new screenshots of Punch-Out!! 's "Head-to-Head" mode, which can be played via split-screen when the game ships this May. While each player will be able to control a character that looks like Little Mac, you won't actually be Little Mac. 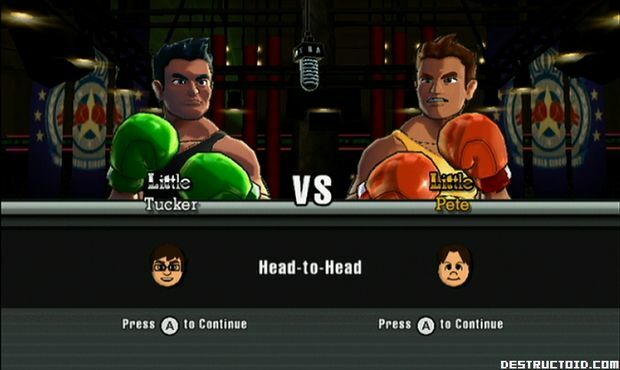 It appears you'll be able to name your character, as shown in the above screenshot with Little Tucker and Little Pete. I think seeing "Little Valerie" or "Little Katherine" is going to look funny below the Little Mac character model, and I hope Nintendo at least lets you put a bow in your player's hair. On a serious note, I'm curious as to how the multiplayer will play out. It's not as if Little Mac has a full arsenal of moves -- he can punch left, right, high, low, and has a super punch. Virtua Fighter this is not. Still, it could be a fun guessing game, and at the very least give us a something to do when we're not pounding on King Hippo's belly.